Set up by Guy Cutler and partner Natasha, Fron Farm Yurt Retreat is an award-winning, family-run farm and glamping site, nestled in a secluded valley near the majestic Preseli Mountains. Just 30 minutes away from the coastlines of Pembrokeshire, Carmarthenshire and Cardigan Bay, the 56-acre organic farm offers visitors an escape from everyday life and an excellent base to explore West Wales. Apart from a glamping experience, the farm also houses a plethora of animals, including sheep, goats and chickens, as well as a large organic vegetable garden, landscaped areas, ponds, woodlands and pastureland. A 15th century medieval church, situated at the end of the site, is currently being refurbished, with plans to host weddings and events in the near future. "We decided that the farm needed to be diversified and were interested in setting up a glamping site. We looked into buying yurts and decided that I had the skills to make them myself. I learnt how to do that, and after making ours, I made a yurt for my mum, then for a friend and it just grew from there. I now make yurts for other people! We were fortunate to have lots of help from volunteers to set up the glamping site, as we had a limited budget. We were also lucky to have lots of energy and vision in what we wanted to create here. I never expected the glamping market to grow so quickly and this has significantly helped our business. Most recently, I have designed a wooden yurt which is suitable for all-year round use, and is very popular amongst people who are setting up new glamping sites or are looking for something with a real wow factor. We have just become a limited company and are starting to employ people!" "Make sure you have a really good business plan – as we have been really organic in the way our business has grown, we could have maybe got to where we are more quickly if we’d put better planning in place." "Being nominated for the Innovation Award in the 2017 Farm Business Show. Also securing a 20-unit order for the forthcoming months." "If our clients are Welsh speaking, my partner Natasha is a fluent Welsh speaker and is happy to communicate bilingually. We get plenty of Welsh speakers staying in the yurts, but most of our clients who buy the yurts are from further afield." 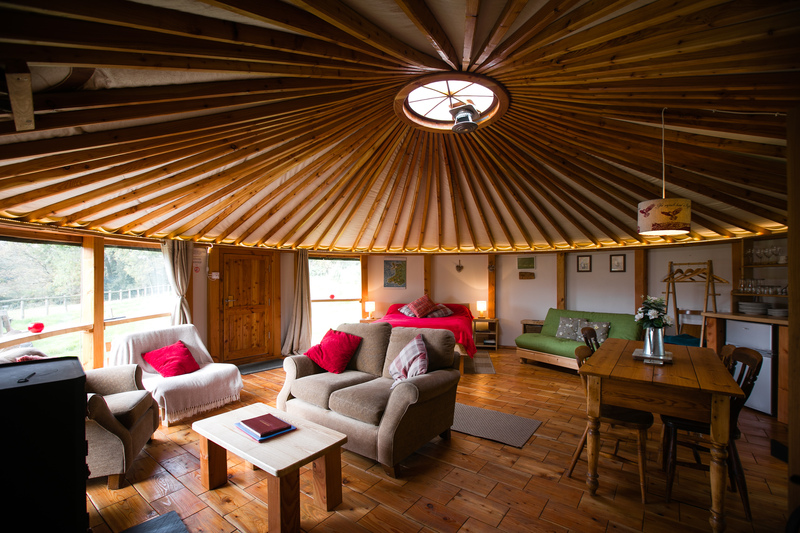 Fron Farm Yurt Retreat and Manufacturing has worked with Business Wales since its inception. With support from their adviser, Lisa Williams, Guy and Natasha were able to get the business up and running. Lisa provided further business advice and support with planning, which has led to the pair successfully separating the retreat and manufacturing arms of the business, and significantly increasing turnover. Fron Farm Yurts have since registered for VAT and have recruited a full-time workshop manager as well as 3 part-time employees to help out during peak times. Guy commented: "We had lots of advice and help from our Business Wales adviser, Lisa Williams, who has been an invaluable contact when we have had questions and has always sent us lots of information when needed. We received a lot of specialist help setting up contracts and employment policies, as well as waste management processes. We have also benefitted from marketing, website design and social media help from the Superfast Business Wales advisers."